Men's Basketball Game: Oct. 23, 2017. Rangers have lost two games back to back. 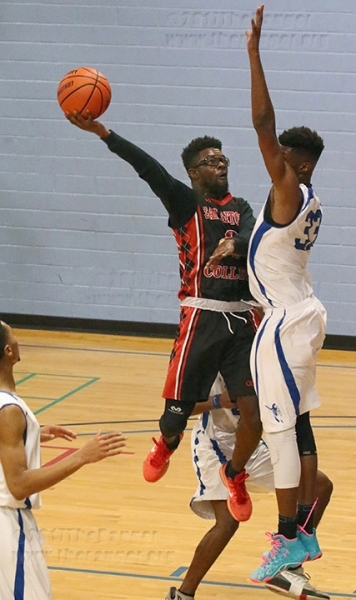 The Rangers lost by 6 points Oct. 23 in the health and fitness center at St. Philip’s College. The Rangers started off the game with quick ball movement and passes and were ahead by 1 point against the Tigers at the end of the first half, 44-45. One outstanding player in the first half of the game was liberal arts freshman Chancelor Whigham, who scored 17 points for the Rangers. In the second half of the game, both teams were aggressive and forceful driving into the paint. At the 3-minute mark, the teams were tied at 76-76, as both teams transitioned to defense in hopes of trying to take the lead. Tigers started double teaming, which caused a 10-second violation on the Rangers who won possession of the ball. The last minute of the game, Tigers players were sent to the free-throw line twice that kept them in the lead and won the game. Kinesiology freshman C.J. Hartfield led the team with 28 points for the Tigers and psychology freshman Hyshone Fisher led the team with 20 points for the Rangers. “It was a good game. Both teams came to play, but we managed to win by 6 points.” Jacque Dupree, St. Philip’s men’s head basketball coach said. The next home game will be against the Trinity Tigers at 8 p.m. Nov. 6 in Candler. Admission is $5 for adults, free for children 12 and younger and students with college ID.